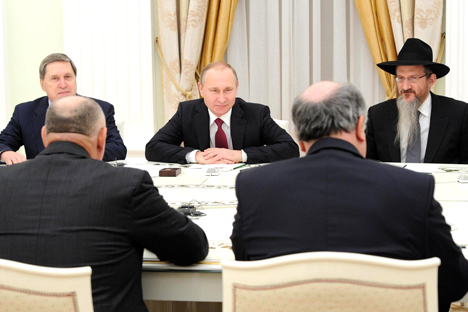 Vladimir Putin during the meeting with members of the European Jewish Congress. The Russian President extended an invitation to the European Jewish Congress, urging Jews from Europe to move to Russia, to escape the increasing anti-Semitic sentiment there. At a meeting he held with members of the European Jewish Congress on January 19, 2016, Russian President Vladimir Putin invited Jews to escape the apparently rising mood of anti-Semitism in Europe and come to Russia, writes the Kommersant business daily. Historically, Jews have faced anti-Semitic sentiments in phases in Russia, forcing them to migrate, but the situation today is much more welcoming. During the meeting with representatives of the European Jewish Congress, President Putin acknowledged that the Schneerson library, which is currently housed at the Jewish Museum and Centre of Tolerance in Moscow, had been a “bone of contention” for some time with members of the American Jewish community. “I hope that now that these books will become available to all who want to read them, that they can be used for scientific purposes and that such acrimony should have no place anymore,” said the President. “In my opinion the situation has changed dramatically,” he said, as he urged the European Jewish community to come to Russia. Moscow’s top Jewish sites: Shalom!